What is being termed a spate of cowardly and senseless attacks in North London, where four people have been stabbed. It is believed that the attacks are linked. Within 10 hours, a woman and three men, who were walking from behind were knifed on the back. Two of the people are in critical condition. For this crime two men have been arrested on the suspicion of causing grievous bodily harm. 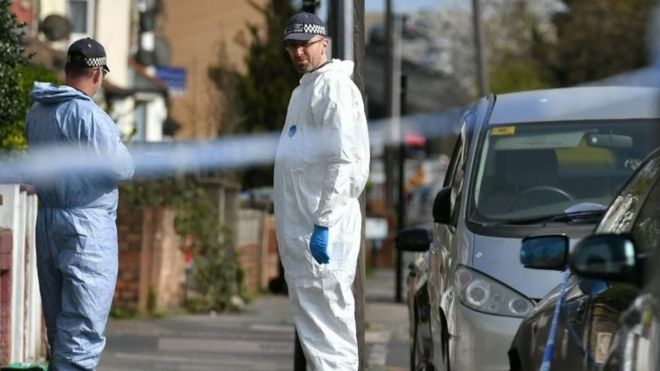 The first suspect was detained just before 11:00 BST in Fore Street, Edmonton, with police saying that inquiries were continuing to establish if he is the person behind the stabbings. The second man, aged in his 40s, was arrested later on Sunday at a residential address in Edmonton. Both men remain in police custody. Because none of the victims was robbed and had not engaged in conversation before being attacked, the Met believes that the motive “appears to be solely to inflict harm”. A spokesman suspects a lone knifeman and “mental health issues may be a factor”. Police believe the third attack happened less than a mile away in Silver Street. The victim, a 23-year-old man, was found injured at Seven Sisters Tube station at about 04:00 BST. He is in a critical condition in hospital. The final stabbing happened at 09:42 in Brettenham Road, less than a mile away from Silver Street. The 29-year-old man has been taken to hospital after being stabbed in the back. He has potentially life-changing injuries. The public is terrified to walk alone in these streets of Edmonton. Detectives said they were searching for a skinny black man, who is about 6ft 3in tall and was wearing dark clothing. The number of knife related crimes in England and Wales have been rising sharply ever since 2014. There were 39,818 knife crime offenses in the 12 months ending September 2018. This is a two-thirds increase from the low-point in the year ending March 2014, when there were 23,945 offenses. Out of the 44 police forces, 42 recorded a rise in knife crime since 2011. According to The Ministry of Justice, Most perpetrators of knife crime are over 18. Also, knife crime tends to be more prevalent in large cities, like in London. While some attribute rising knife crime disputes between gangs and drug dealers, others attribute it to decreasing police budgets. In fact, there is a steep decline in ‘stop and searches’ across England and Wales. From 2009, the number of stops fell sharply across England and Wales, especially in London, primarily because of concerns that the measures unfairly targeted young black men, wasted police resources and were ineffective at catching criminals. This is indicative of the fact that the police and relevant authorities increasing believe that random and brute-force measures are ineffective in preventing crime, especially in areas with high crime-rates like London City. To add to this, the number of police officers in England and Wales has decreased by more than 14% since 2018. This may not seem much, but it means that for every 7 police officers, there now are 6. Last year, a Home Affairs Committee report said police forces were “struggling to cope” amid falling staff numbers and a leaked Home Office document said they had “likely contributed” to a rise in serious violent crime. The need of the hour is to prevent and solve the crime with the same number of police force available. This can only be done with the help of a disruptive method or technology,. Some sort of a revolution in intelligence gathering and investigation is needed to make this paradigm shift possible. Can Modern Science solve this quest and bring crime down, in such a case where there is very little chance of conventional investigation to trace links between four random murders? The answer which the law enforcement agencies are looking for has arrived in the form of a revolutionary technology called iCognative. It has been developed and is marketed by Brainwave Science, headquartered in the United States of America. iCognative technology presents an accurate method to determine whether crime-specific information is present in the mind of the suspect or not. It does so with an accuracy of more than 99%. iCognative technology is highly reliable. It is applicable in around 85-90% of criminal and civil cases. The operators from the agencies find it extremely to learn and use. iCognative is a highly portable intelligence gathering technology because it requires only a specialized headset and a computer. iCognative can be used as a litmus test on the captured suspects to help the authorities to quickly determine if they are innocents or have anything to do with these attacks. Such suspects usually deny being privy to crime-related information. iCognative is a reliable and accurate technology to detect if a person has an awareness of details which only a criminal or a planner must know. The suspect is made to wear a headset equipped with EEG sensors to pick up electrical responses to stimuli which are flashed on a screen. Stimuli consist of images, words or phrases related to the crime. In the case of the stabbings of the 4 people, evidence such as details of each of the four crimes, which include but are not limited to times, pictures of the exact location, nearest landmarks, description of the victims were wearing, pictures of the victims crime, will be uploaded by the test administrator into the iCognative system in order to conduct a test. Similar tests with crime specific stimuli can be conducted on suspects in other stabbing cases. The revolutionary database analysis technique of the software will be able to detect linkages among the cases. Investigating agencies of Met Police must try iCognative on the arrested suspects in order to quickly detect their involvement and to gather information so that further attacks can be prevented. This technology can also accurately detect if a test subject has been radicalized or is aware of hateful ideas, such as the one propagated through right-wing and extremist propaganda.